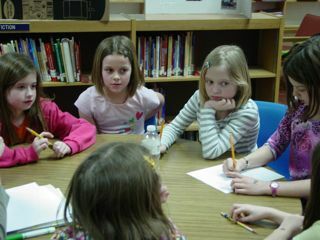 Several third grade girls are working with Mrs. Zirbes to create a specialized toy. 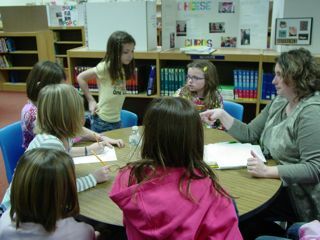 During this session, they each talked about what makes toys their favorites. Below is a movie of their presentation to their classmates and teachers. Watch what happens to their toy at the end! At Rusch, a team of girls who have been together for years, spent the last few months working on a Destination Imagination challenge called "Coming Attractions." They presented their skit at the regional competition in Waunakee. Another part of the competition was an "Instant Challenge" where they are given a situation to create and perform in seven minutes! The girls did a great job of problem solving and using each of their strengths!